From DG: In a recent post, about what Miriam Makeba meant to me (Nov 13—Thank You Miriam Makeba) I mentioned that Odetta was another big influence from the early part of my life, but said it was a story for another day. Well, I am sad to say that day has arrived, not in the way I intended, and much sooner than I imagined. We had two of her records when I was little—Odetta Sings the Ballad for Americans, and Odetta and Larry. I was drawn to the earthy rumble of her voice, often accompanied by simple acoustic guitar. I still know all the words to Great Historical Bum, and even now, with the help of bathroom shower acoustics, I find myself trying to sound like her singing Santy Ana—I don’t, but I feel where she was coming from. I’d have Mom play those records over and over, and I’d listen, and look at her on the album cover with her guitar, and her short cropped hair. This was 1960—we didn’t even have the word Afro yet, but looking at the photos now I realize how far ahead of us she was in many ways. We all need those people who blaze the trail, show us what’s possible, encourage us not to be afraid. I have been fortunate enough to meet many celebrated people in my life, including President-elect Obama. 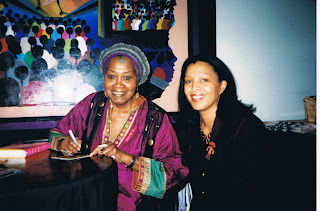 I had no trouble speaking with him, but when I met Odetta at Crossroads Theater in 1998 (she had written original music for a Leslie Lee play called Spirit North), I could hardly put a sentence together, and as she signed her CD for me I was working hard not to cry. But I was really happy to have met her. It feels like a whole era is coming to a close, but I guess that’s how the world goes ‘round. I am grateful to have been nourished by it. It made me wonder who are the people whose music moves people forward now? Tracey Chapman? Bono? India.Aire? Telib Kweli? Who makes you feel, think, imagine and grow while you listen?